The calendar may be telling you that summer is officially over but, even though it’s back-to-work and back-to-school time there’s still plenty of good weather left so relax and continue enjoying your outdoor space. At our house, we use our porch all through the fall. 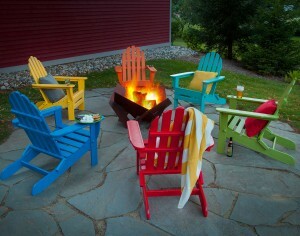 We don’t even think about putting away our Adirondack chairs until the snow flies! Fall is a great time to spruce things up a bit since there are lots of end-of-summer sales and you can generally find accent pieces like pillows and outdoor rugs at terrific prices. Buy now and you’ll be all set for next spring! Freshening up the flowers in your planters for fall? It might also be time to think about adding a few new planters to dress up your porch, patio or deck. If you love wood planters (and most of us do!) 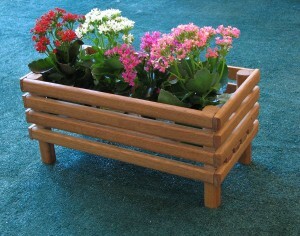 you might like to add a Teak Chippendale Planter or a stunning Oak Planter. Fall brings great weather but it does get dark sooner. To keep you outside after the sun sets, great lighting is a must. Illuminate your deck, garden or patio at night with a Titan Post LED Cap Light. 5 colors to choose from and easy to install. 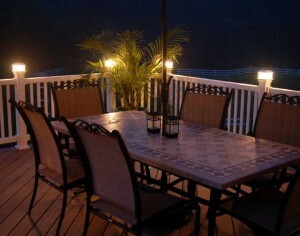 Or check out our Orion LED Post Cap Light — beautiful, yet durable, and the perfect accent to extend your outdoor season. Nothing is better on an autumn evening than gathering around an enticing (and cozy!) fire pit. Listen to the sounds of nature, have an adult beverage and enjoy! Fire pits are a specialty of ours and there is sure to be one which will suit your design style. Love simple elegance? Then our Saturn or Manta Ray fire pits are for you. Looking for something with a bit more drama? Check out our amazing Third Rock Fire Pit! Let the good times roll on your porch, deck, patio as autumn comes on strong. There’s still lots of time (and ways!) to enjoy the great outdoors.